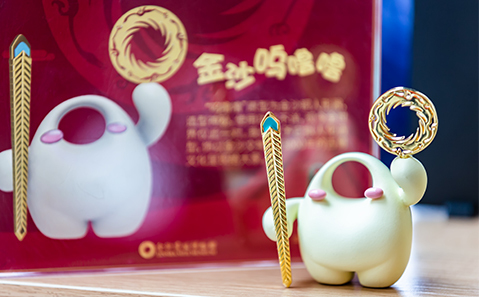 As the Chinese New Year draws close, the annual Jinsha Sun Festival is going to be held in Chengdu Jinsha Site Museum soon. 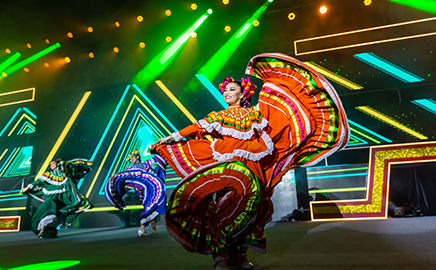 After the past several festivals focusing on world-cultural themes like ancient Rome and Egypt, and Pompeii, this year’s event will be constructed upon the Mayan civilization from Mesoamerica, with which Jinsha has formed an indissoluble bond. During the Sun Festival, visitors will be welcomed with festoon lights, various performances, themed exhibitions, beautiful garden landscapes, etc. Though thousands of miles apart, the ancient Shu and Maya have many things in common. They both stood in awe of nature and conceived everything has having supernatural powers. Moreover, they both placed high significance on sacrificial ceremonies and offered countless sacred offerings to their ancestors and gods. They worshipped the sun and trees and had created exquisite artifacts in such themes. Recently, Jinsha Site Museum has signed a MoU with researcher Mr. Jose Guadalupe Huchim Herrera from INAH (Instituto Nacional de Antropologia e Historia).He agreed with the above opinions and claimed, "I am astonished that there are so many similarities between the two faraway cultures. They are just like two parallel cultures. Jinsha site can be seen as a paradise for human history and culture. This year's Jinsha Sun Festival will focus on the similarities in universal views and religious beliefs between the two ancient cultures and will showcase their splendor in a variety of forms. 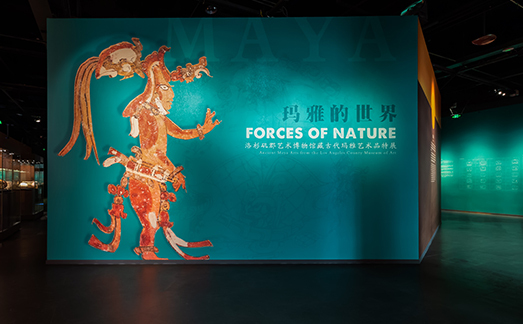 The ongoing special exhibition in Jinsha marks the first of its kind in Sichuan province, which presents 214 pieces/sets of ancient Mesoamerica artifacts from the Los Angeles County Museum of Art (LACMA). The exhibits tell the stories of the universal views, religious beliefs, royal powers, arts, and societies of the ancient Mayan people. Since the opening ceremony, the exhibition has been widely popular among audiences from home and abroad. 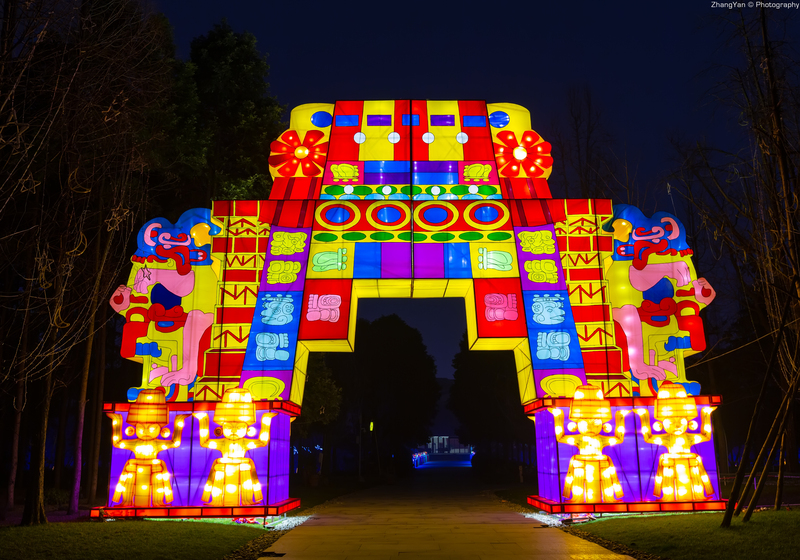 During the 2019 Jinsha Sun Festival, colorful festive lanterns decorate the entire park, including five large-scale ones with over 15 meters in height. 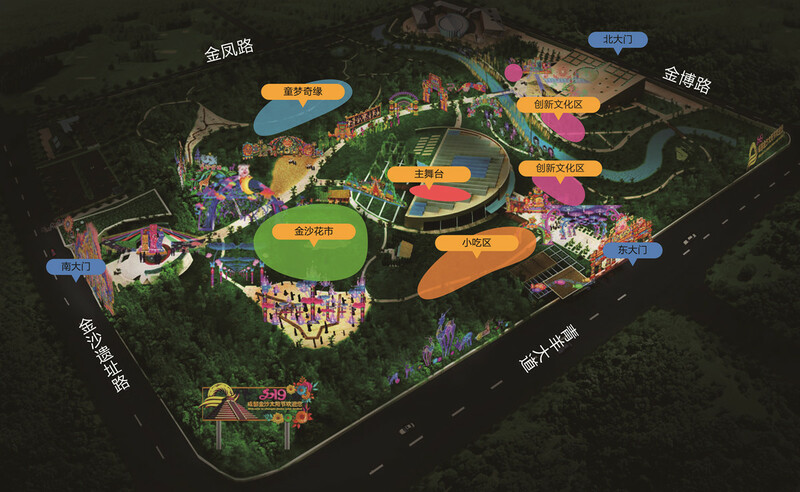 Moreover, over 5000 strings of decorative lights hanging over the trees will illuminate the night sky of Jinsha. The design of large-scale lanterns drew inspirations from ancient Maya and Shu cultures. For example, some depict Maya deities such as the god of sun and the maize god, while others feature Shu scenes such as fishing and sacrificial ceremonies. Moreover, many creative lights are presenting Mayan hieroglyphs and patterns engraved on Shu artifacts. Lastly, the pig-themed lights conveyed the best new year wishes to visitors for the Chinese New Year of the pig. 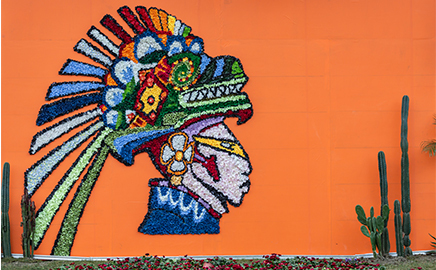 As the most popular place for photography during the festival, this year’s flower market constructs a beautiful landscape in the leitmotif of a Mexican garden. There you shall see cultural elements from the Maya world, natural sceneries along the Gulf of Mexico, and traditional handicraft of the Mexcian people.